The use of the TXM “Solving Problems Every Day(r) approach with concern strips was a key factor in the success in improving quality and OEE at Laminex. Our client is a leading manufacturer of high quality construction materials in the Asia Pacific. The client engaged TXM to improve their componentry site. Highly complex, with a history of poor performance, the plant experienced excessive lead times, high costs and a high level of rework, preventing the business from performing. TXM mapped the end-to-end process using value stream mapping in our Manufacturing Agility Process®. This identified the root causes of long lead times and high costs. Key issues were the high level of rework and the high amount of inspection labour involved in checking, correcting or re-working. TXM established an Andon system, enabling operators to highlight problems in process and ensure they were addressed quickly rather than passing on the defects to the next step of the process. Structured problem solving was introduced – based on the TXM Solving Problems Every Day SPED™ methodology. 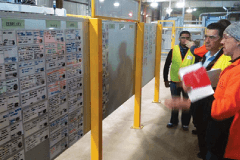 TXM implemented the Lean Daily Leadership Process LDLP® across the plant including Practical 5s™ Visual Management, Standard Work, and Value Stream Mapping (MAP®). P5S visual standards were established across the plant (even in amenities), with required tasks displayed using tee cards and audits conducted weekly. TWI (Technical Work Instruction), Standard Work, Leader Standard Work were used to stabilise and control daily production. TPM daily routines combined with P5S ‘Clean, tighten, lubricate’ tasks and rigorous SPED™ daily problem solving focused on key under-performing machines. Importantly our client supported the change by appointing a Lean Champion and making key structural changes to ensure that improvement was supported. Over a 12 month period, TXM achieved a fundamental change in the operational culture. This lead to dramatic improvements in performance. A 90% reduction in lost time injury rates. Lead time for joinery kits has been halved. End of line defects reduced by 75%. OEE increased by 100% in the automated shelving production process. Importantly operational performance has improved significantly, giving the business the confidence to continue to invest in the site.